Individual counseling– This is usually on an as needed basis, meaning students can self- refer by checking in with me in the guidance office. Teachers, staff, and parents/caregivers can refer a child to me as well. I will meet with students weekly as needed, but if/when a student requires long-term counseling, I may suggest a referral to our school-based clinician or an outside counselor. In my office, counseling usually involves both a systems-oriented and strengths based approach with students. This means understanding the fact that students live within an environment that they must constantly and effectively adapt to. I believe helping students discover their strengths is the single most effective tool in allowing them to discover their path to success. Small group counseling– All of my groups focus on social skills and/or friendships. Some students are included because of parent requests, others because they could benefit from positive social interactions at school, and some because they are great role models for their peers. The groups meet for 45 minutes in my office for several weeks. Generally we meet during lunch, study hall, or another time in the day when students will not be missing academic work. If your child is selected to participate in a group, I will make sure you have advance notice. Classroom guidance lessons– As a school counselor, I am required to teach whole group lessons at each grade level. Topics covered in classroom lessons include, stress and time management, conflict resolution, bullying, internet safety, careers, and personal safety. Other roles at BJHS include consultation and collaboration with staff, parents, and the community, crisis intervention/support, and any necessary referrals for outside services. As a school counselor, my ultimate goal is to provide personal and educational support to all students. 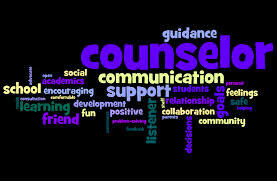 By contributing to the many elements of the school counseling program, I hope to promote student success in a way that benefits the school community as a whole.